Recent changes give more clout to open source technology. 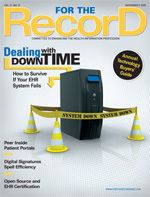 As hospitals and physicians implement EHRs to become eligible for financial incentives as defined in the American Recovery and Reinvestment Act of 2009 (ARRA), they must demonstrate “meaningful use of certified EHR technology.” These provisions are meant to ensure that taxpayer dollars go to the adoption and use of the tools that have been shown to improve quality and reduce costs. Between the upcoming definition of meaningful use to be standardized by the U.S. government and the current reform discussions, the healthcare industry is moving forward to enhance clinicians’ workflow and patient outcomes, improving the efficiency and quality of medical care. But as we wade into the details of defining and certifying meaningful use, it is critical to raise questions such as the following: Why has EHR use been so limited? How can meaningful use be defined to help drive widespread adoption? Certifying basic standards for EHRs comes in conjunction with developing the technology for the past 20 years. But currently, the vast majority of provider organizations have not fully implemented EHRs. To get to the fundamental reasons why, we must look outside healthcare and focus on technology adoption in general. The first reason is that EHRs have not yet “crossed the chasm,” a term coined by technology guru Geoffrey Moore that refers to the natural history of technology adoption. According to Moore, adoption proceeds in stages—the early, the mainstream, and the laggards—and the biggest leap is from early to mainstream. For the healthcare industry, the low level of EHR adoption—roughly 1.5% in U.S. acute care hospitals—clearly demonstrates that the technology has not yet made the leap to achieve mainstream adoption. A particular challenge is that solutions developed by EHR vendors in partnership with their early adopters are often complex and thus expensive. This is primarily because early adopters are well funded, innovative, and comprehensive in their product vision and requirements. They design a comprehensive product in which all potential requirements must be considered. This yields a complex solution that the mainstream sees as too much, too complex, and too costly. Early adopters also deploy a comprehensive solution; there is a fear that if customers don’t use a comprehensive solution right away, they will never see the need for the technology. This has led to comprehensive, bulky EHR solutions that are not widely adopted. To maintain a base level of quality standards, the Certification Commission for Health Information Technology (CCHIT) has, for the last few years, developed “comprehensive” standards that have only further complicated adoption and the EHR certification process by calling for hundreds of certified EHR features and functions. Certification in support of meaningful use should not be based on features provided by vendors; standards should be based on the technology’s successful implementation and meaningful use. With complex certification standards, hospitals implement EHR systems that are proprietary and laden with features. This ensures the profitability of vendors, as hospitals must pay for licenses and separate implementation and support services. In large part, the business model is based on the customers’ dependence on the complex proprietary code. This prevents flexibility, sometimes making it difficult for the technology to adjust to a hospital’s needs. As a result, project extensions become routine, and interoperability challenges between complex systems become a concern. The final roadblock to more widespread EHR adoption is that the proprietary model does not support collaboration and customer control. Healthcare is collaborative; interoperability requires collaboration, and attaining meaningful use requires customer control. Associated with no up-front costs, open source EHRs are a viable solution for those organizations that previously could not implement the technology due to the costs and vendor lock associated with proprietary systems. • adding reform that supports billing for quality to the 2011 incentives. These actions will allow a service industry to develop that helps providers reach meaningful use and achieve quality care. A recent federal reassessment of EHR certification requirements has brought about significant changes in the process. While the CCHIT was recognized as the certification body prior to the ARRA, Health and Human Services (HHS) will now oversee multiple organizations that will certify health technology. The Office of the National Coordinator for Health Information Technology will be working on its own certification criteria with the National Institute of Standards and Technology (NIST), which will assess conformity and accredit certification bodies. The policy recommendations are broad and define EHR certification standards that focus on improving patient care. In a shift away from the CCHIT’s previous focus on comprehensive feature function criteria, the revamped EHR certification standards will be relatively simple. This time, there will be no focus on vendor-locking features. Instead, the committee will place an emphasis on desired uses and results—more practical for clinical purposes—and work on security, privacy, and interoperability issues. Policy reform should also make the certification process more objective and transparent. The federal committee did not adopt the CCHIT as its certification body due to the possibility of a conflict of interest and its comprehensive approach to certification criteria. The CCHIT can still be a certifying body but only under the process as defined by HHS. The intent is that there would be a market for certification and that the NIST would oversee conformity. Certification standards will expand to include a range of software sources, such as open source technology, self-developed solutions, and other nonproprietary technology. The committee made it clear that it wants to ensure that open source projects and self-developed systems have a level playing field. The cost and the difference in the nature of those development projects were taken into consideration. Support for modular product certification, site certification, and not requiring lockdown of code were some of the changes recommended. Lastly, it is important for upcoming healthcare reform to develop a short-term transition plan. HHS will be proposing a certification process by the end of the year based on the refinement of the meaningful use criteria. The CCHIT may be an early alternative if it adopts the narrowing approach as recommended. These recommendations offer great promise that the ARRA incentives and the supportive certification processes will be focused on results. They clearly recognize that the widespread use and adoption of tools is the goal. With additional details to be determined shortly, EHR certification is on its way to improving the healthcare system through policy reform and the meaningful use of HIT. — Edmund Billings, MD, is the chief medical officer and executive vice president of product at Medsphere Systems Corporation.